Former National champions B. Adhiban and Krishnan Sasikiran have made it to Round 2 of the Chess World Cup being played in Tromso, Norway. 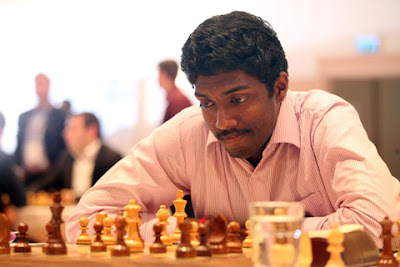 Pitted against a much higher-rated rival, Adhiban displayed top form to beat Evgeny Alekseev of Russia 5-3, winning in the blitz tiebreaker while Sasikiran prevailed over Constantin Lupulescu of Romania 2.5-1.5 cruising past in the second rapid game to reach the round of 64. Parimarjan Negi lost to Yuri Kryvoruchko of Ukraine in the mini-match. Parimarjan lost 2-4 but before that he won the first rapid tiebreaker as black. He blew it away with white pieces in the return game. Adhiban’s victory turned out to be the second biggest upset in the World cup so far after Wei Yi of China had beaten Ian Nepomniachtchi of Russia. Ranked way below, Adhiban showed a lot of determination and played with his heart out to beat Alekseev, a member of the top 50 club it he world rankings. It started with the rapid tiebreaker wherein Adhiban drew the first blood but lost the return game. The stage was thus set for two 10-minutes each games that ended in draws. Alekseev missed out on a clear advantage in the subsequent five-minutes each blitz game and ran out of time and in the second blitz game Adhiban gave no chances and picked up as many as three pawns before the Russian called it a day. 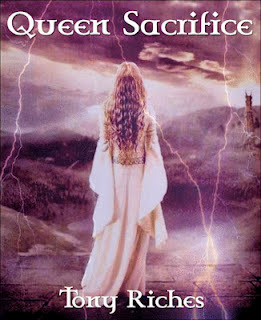 Sasikiran gave a perfect display of technical chess to outplay Lupulescu. 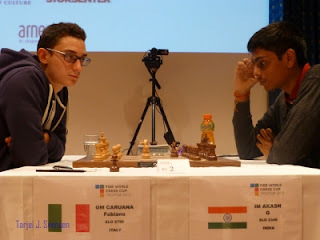 Playing the white side of a Queen pawn game in the second rapid tiebreaker after drawing the first, Sasikiran weakened the king side with some precise moves in the middle game and launched an attack on the king side to knock down a pawn for no compensation. The rest was child’s play for the seasoned Indian. Negi was unlucky yet again. In the normal games too he had won the first game with black pieces but could not make a draw as white and in the second too it was a similar story. Winning with black with a fine combination, Negi got a balanced position again as white but missed out in the endgame to let Kryvoruchko level the scores again. In the next set of tiebreakers, Kryvoruchko won both games. 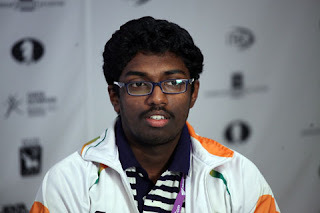 Sasikiran has a tough challenge to tackle in Sergey Karjakin of Russia in the next round of this USD 1.6 million event. Adhiban will take on Alexander Fier of Brazil in what is expected to be an even contest. According to the regulations of the World Cup tiebreaks two rapid games are played at a rate of 25 minutes for each player with an increment of 10 seconds per move. If the score is still tied two accelerated rapid games are played with a time control of 10 min + 10 sec. If the score is still deadlocked two blitz games are then played at 5 min + 3 sec. Finally, if a winner has still not been determined a sudden death Armageddon game takes place with 5 minutes for White and 4 minutes for Black with a 2 sec increment after move 60. In that game Black has draw odds (i.e. he wins if the game is drawn). A total of 15 players were eliminated after the tiebreaks. 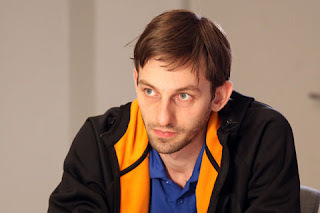 In general, the favorites won their matches: Peter Svidler, Michael Adams, Alexander Morozevich, Dmitry Andreikin, Anton Korobov, Jobava Baadur and Alexei Dreev all went through to the next round. Georgian GM Jobava Baadur won against Ukrainian GM Martyn Kravtsiv with a 2-0 score. At the same time a few of the rating favorites were unexpectedly knocked out of the World Cup at this stage. Norwegian player GM Hammer defeated Armenian GM Sergei Movsesian in the first game of the playoff and drew the second game, thus eliminating his more experienced opponent from the FIDE World Cup. Brazilian GM Alexander Fier defeated an opponent more than one hundred points higher rated, Polish GM Radoslaw Wojtaszek. Women’s World Champion Anna Ushenina lost the first rapid game but could have upset Peter Svidler in the second. She missed her chance and the Russian player won the match. A total of 13 rapid matches finished drawn so 26 players continued their battles at the 10 min + 10 sec time control. 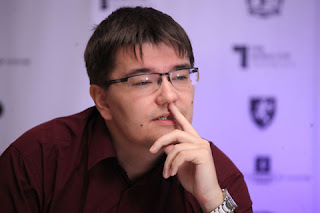 Gata Kamsky, Alexei Shirov, Teimour Radjabov, Ruben Felgaer, Rafael Leitao, Eltaj Safarli, Viktor Bologan, Yuriy Kryvoruchko and Alexandr Shimanov were successful at that stage.Not an easy match for Gata Kamsky, who only managed to win the fifth game against Chinese IM Lou Yiping. 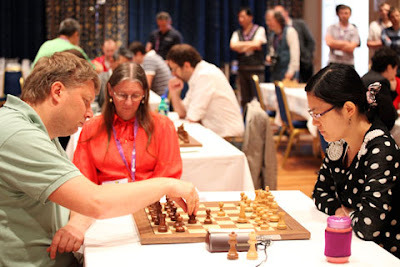 Hou Yifan and Alexei Shirov exchanged victories in rapid and continued their match. The Latvian player proved to be stronger at the 10 min + 10 sec time control. Despite the final outcome, the former Women’s World Champion showed great play in the event. After two draws in the classical games Azeri GM Teimour Radjabov struggled against GM Jorge Cori (Peru) in rapid – each won a game. The spectators were waiting for an exciting continuation at the 10 min+10 sec time control. Surprisingly, Cori didn’t appear in time for the first game. 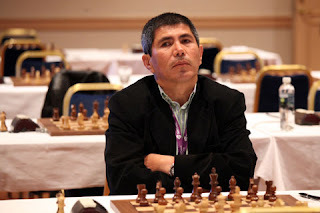 One second after the start of the round, Teimour Radjabov stopped the clock, signed the score sheet and left the playing hall, while Jorge Cori was running to the playing hall. Using the advantage of the white pieces the Azeri player didn’t have any problem drawing the second game. After the end of the match GM Cori from Peru made an appeal. The decision of the Appeals Committee has been published here on the official website. Cori said he had heard wrong the start time and rushed to the hall only after seeing the players walk in via the live Internet feed. A little less than 2 minutes later Cori came to the playing hall and tried to explain what had happened. Also, an unfortunate day for Russian GM Alexander Riazantsev, who lost against Argentinian GM Ruben Felgaer. Four matches remained to be decided in blitz. Two Russian GMs Zvjaginsev and Alekseev were defeated by Polish GM Swiercz and Indian GM Adhiban respectively, while players on the two remaining boards reached Armageddon games. 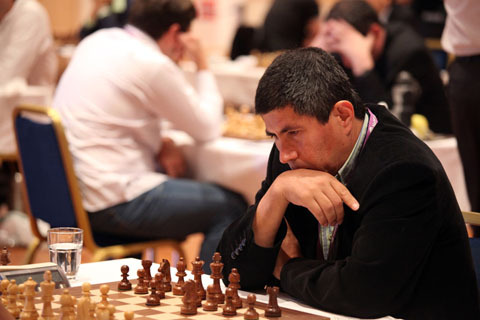 Many participants of the tournament and spectators came to watch the matches Tomashevsky versus Ramirez and Melkumyan versus Granda Zuniga in the playing hall. Playing White Evgeny Tomashevsky defeated his opponent and Granda Zuniga, who played with Black and just needed to make a draw to advance, also managed to win. The second round of the FIDE World Cup starts at 3 p.m. local time on 14th of August. 64 participants will continue playing but as before only half of them will advance to the next stage. 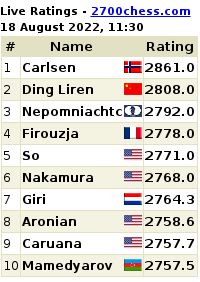 You can watch the live broadcast of the Chess World Cup 2013 at the official website. 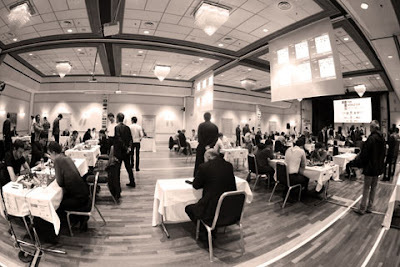 A chess feast is set so mark your calendar for the World Chess Cup 2013 from August 11-September 3 in Tromsø Norway. 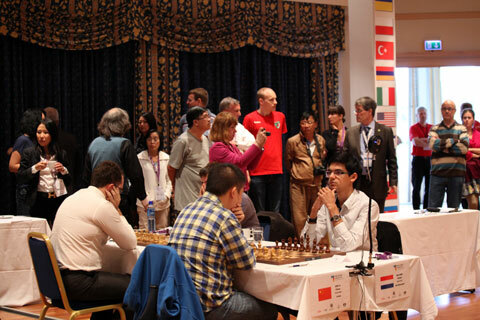 We are delighted to officially announce the 128 players in the FIDE World Cup 2013 in Tromsø. 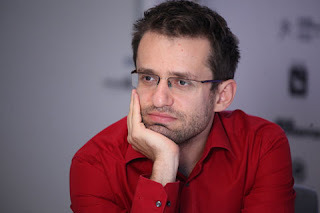 In the 1st round of the World Chess Cup 2013, the three top-seeded players GM Levon Aronian of Armenia, GM Fabiano Caruana of Italy and Russian GM Vladimir Kramnik face Mikhail Markov (2305) of Kyrgyzstan, IM G. Akash (2332) from India and FM Gillian Bwalya (2310) from Zambia respectively. Previous World Cup winner GM Peter Svidler of Russia faces reigning Women's World Chess Champion GM Anna Ushenina of Ukraine. Watch the live broadcast of the World Chess Cup 2013 at the official website beginning Sunday, August 11. G. Akash happens to be the youngest-ever Indian chess player to have won the Indian national chess title breaking Viswanathan Anand's record. He is participating in the event for the first time. The other Indians in the event are Parimarjan Negi, B Adhiban and Krishnan Sasikiran. 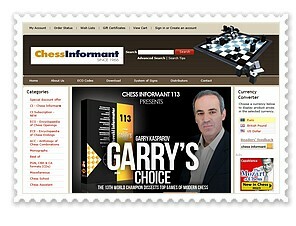 The World Chess Cup 2013 is a part of the World Championship Cycle 2012-2014. The winner and the runners-up will qualify for the Candidates of the World Championship cycle 2012-2014. There are 128 qualifiers (in order of priority): World Champion + four (4) semi-finalists from the World Cup 2011, Women’s World Champion, World Junior U-20 Champions 2011 & 2012, eighteen (18) rated players as described in 3.1.2, ninety (92) players from Continental Championships, six (6) FIDE President nominees, four (4) organiser nominees. There will be six (6) rounds of matches comprising two (2) games per round, with the winners progressing to the next round, plus the final seventh (7th) round comprising of four (4) games. Here is the official video of the World Chess Cup 2013. 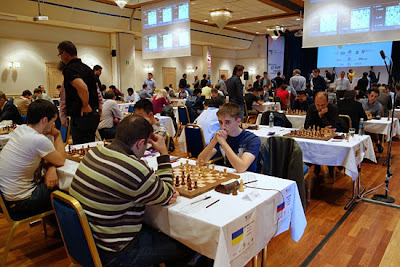 Tromsø Chess Club (TSK) and Tromsø Youth Chess Club (TSKU) are organizing a series of open tournaments on the sidelines of the World Chess Cup 2013. Title players who get knocked out from the World Cup will play in these tournaments. Arctic Chess NGP, an international weekend tournament, will be held on 16-18th August as a seven-round swiss open. The total prize fund is 5000 EUR. The first three rounds will be played with the time control 20′+5”, while the remaining four rounds will be played with classical 90′+30”. The legendary TSKU chess cafe will be operating outside the playing venue throughout the tournament. One of the strongest Egyptian Grandmasters Ahmed Adly will have to skip the event due to obligatory service in the Egyptian Army. Adly told The Chess Drum that he had exhausted all efforts including the submission of an official letter from the Ministry of Sports. The other Egyptian players (GM Bassem Amin, GM Essam El-Gindy and IM Samy Shoker) were not affected. For the pairings please see the Results and Pairings page. The ACP, in collaboration with Science Park Amsterdam Chess, has announced the 'ACP Golden Classic' that will take place in Amsterdam from 14 to 22 July, in the same venue and at the same time as the Dutch Championships and the SPA Open.